Looking for a heavy duty, professional video camera support system? Look no further than the Manfrotto 509 HD Pro Head. The 4-step counterbalance mechanism ensure optimal balance and quick set up, with the ability to support up to 29 pounds. 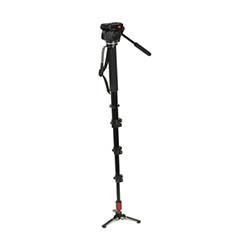 Featuring easy-link connectors, ergonomic adjustments, lightweight, PVC-free materials, and Bridging Technology with a ball bearing drag system, the tripod head offers professional quality stability and smooth movement for your shooting needs. Not only that, but the Pro Head features Advance Balancing recording, allowing you to perfectly position and balance your camera equipment and call upon it later, reducing time needed for setup and making sure you’re on the fast track to success.